Coming to Old Vine Cafe was a result of other places that we meant to go being unavailable. I won't point fingers but a restaurant I had made a reservation at proved to be closed once we drove up. You'd think they'd let us know when we make a reservation right? So after much driving around searching on my Yelp bookmarks, we finally decided to come here because Duc had his camera for the night so we wanted to eat somewhere with photography potential. What a place to pick! 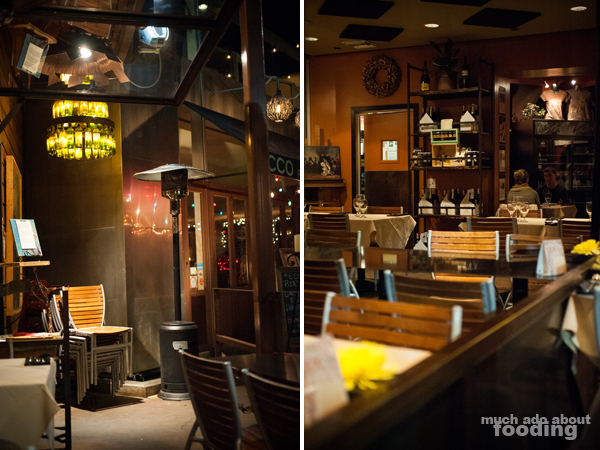 Despite there being a sizeable party of several tables inside this rustic, cozy restaurant, we were still able to be seated outdoors amidst some twisted wood and wrought metal. 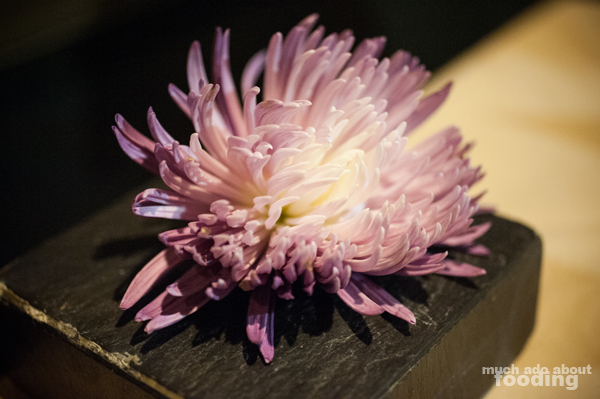 Our table had one simple fresh flower as decor, lending an elegant feel to our dinner. Duc took a look at their wine list (bound in worn and embossed leather) and really liked what he saw - we even paid compliments to the staff for their unique choices and excellent arrangement of the list itself. Our menus came out attached to canvas paintings (how quirky!) and featured in the first few pages their tasting menu options. These would be several courses in a meal paired with the appropriate wines. 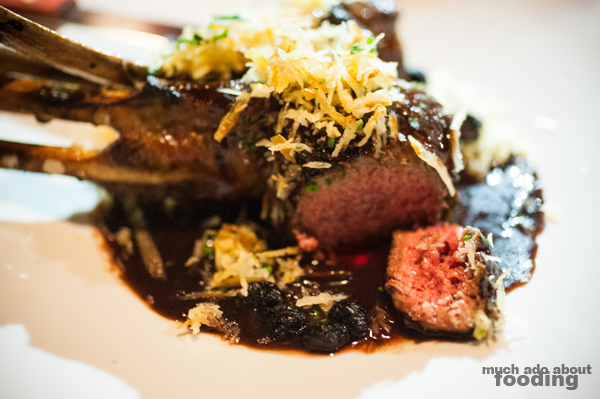 Since we were out for just a casual dinner that night, we weren't too willing to shell out $65-$80 each for a tasting menu but what lovely selections they had there too! Instead we opted for individual dishes. He went for the Beef Tenderloin Stroganoff (vintage premium natural beef tenderloin medallions & Shiitake mushrooms served over handmade fettuccini drizzled with creamed demi-glace) and I the Char-Grilled Lamb Chops (two all-natural Australian chargrilled chops with dried blueberry Syrah demi-glace, garnished with crispy fried yucca). 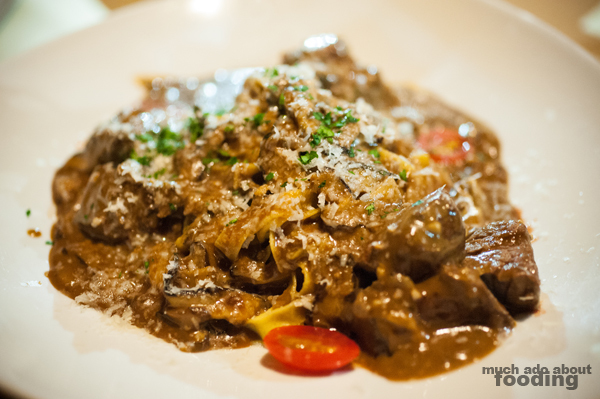 Their tender beef medallions and light handmade pasta were all too lovely basting in the savory, creamy sauce and highlighted with soft mushrooms. 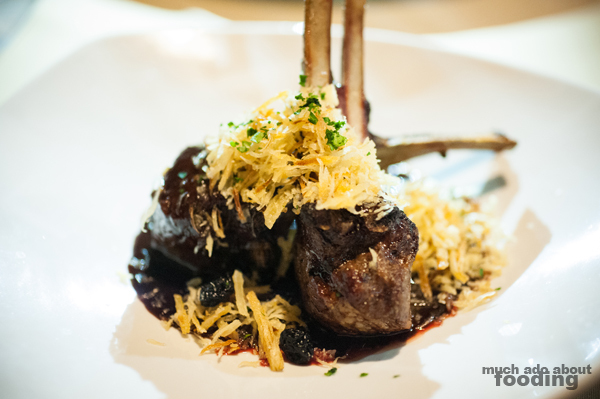 My lamb chops were grilled perfectly with a juicy, succulent center each; the char on the meat was well-complemented by the tanginess of a blueberry demi-glace and mimicked by the fried yucca. Our wallets were telling us no more and to leave the delicious night alone but our eyes upon seeing the dessert menu exclaimed, yes yes let's have some. 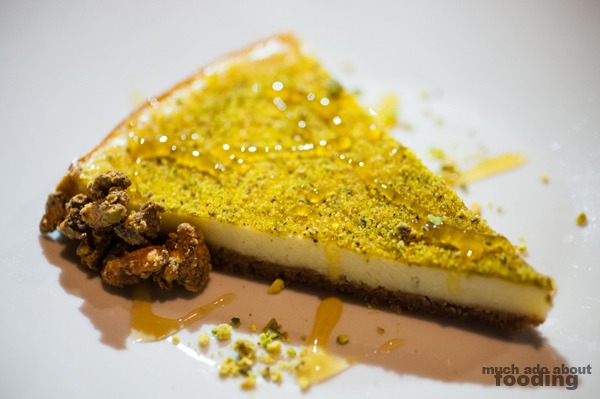 My hats off to the sweet tooth that won out for our pistachio crusted Bleu cheese cheesecake drizzled in organic wildflower honey was the perfect end to the meal. It was definitely an irregular type of dessert, and every bite brought forth an "Interesting..." reaction. However, it was still delicious. The pistachio dust, as I'll call it, on top lent a slightly salty taste to help offset the strength of Bleu cheese. We both enjoyed it and overall, found Old Vine to be perfectly lovely.